Last year at the Windows 10 event, Microsoft announced a slate of upcoming Windows-compatible virtual reality (VR) headsets from Acer, ASUS, Dell, HP and other PC manufacturers that would work without desk- or wall-mounted sensors (similar to its HoloLens device). Lenovo is the first to showcase the prototype for its own self-contained VR headset, which is making its debut this week at the annual International Consumer Electronics Show (CES) in Las Vegas. 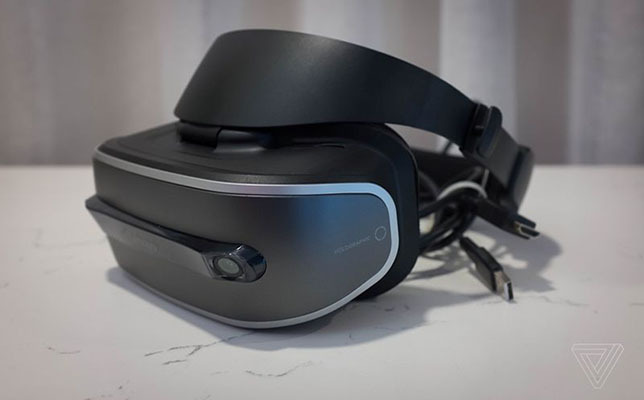 Lenovo’s prototype headset is compatible with Microsoft’s Windows Holographic platform. Like the HoloLens, its design features depth-sending cameras located on the front of the device, allowing full-room movement tracking. The device has two 1440 x 1440 OLED display panels that claim to provide a higher resolution than its competitors Oculus Rift and HTC Vive. It’s also much lighter, weighing in around 350 grams compared to 550 grams for Vive, according to various news reports. The new headset is expected to cost $300-$400. However, the prototype device is not yet fully functional, Engadget and The Verge reported after testing the device on the CES show floor. It is expected to arrive sometime in the second half of 2017.